Damage/Repair major cracks in the back of face mask and in the back of antelope head, wear and shallow cracks in horns, some oxidation in metal, stain from water to the back of face mask, a few cowry shells missing. Some cracks in mouth. 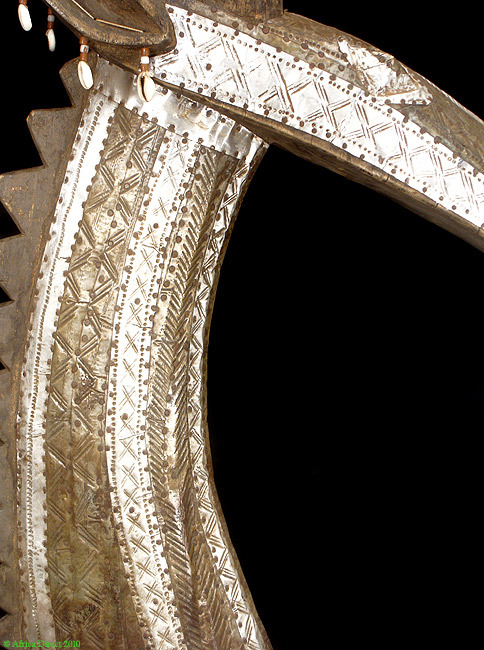 Additional Information: A towering Kurumba "adone" headdress with a surface nicely decorated with copper alloy and tin sheets, with beads and cowrie shells attached to the back. The Adone is one of the most well-regarded and recognizable styles in African art. The Adone represents thh soul of a specific deceased elder and is used in burial and funeral services. The Adone also makes an appearance just before the growing season to bestow the blessings of the ancscestors on the crops being planted. The mask represents a physical reembodiment of a specific spirit and is even refered to by that person's name. When the mask is not in ceremonial use, it will be placed on an altar in the home. The Kurumba are a small culture living on the border of Mali and Burkina Faso, not far from Bandiagara and the Dogon. 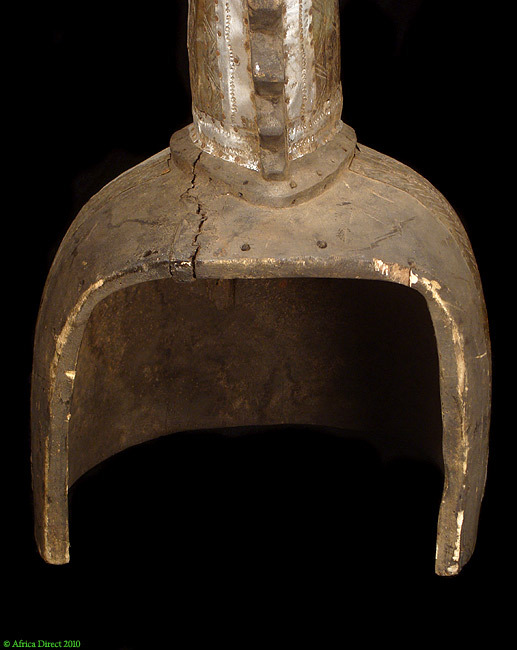 Little is known about their early history, but they are undoubtedly linked in some way to the Dogon. They call themselves the "Nioniose," and are perhaps descended from the few Dogon who chose to join Mossi Muslim society during their late 15th century invasions. The Kurumba produce a uniquely dramatic and beautiful antelope headdress that they call adone, which is danced at the end of the mourning period for a chief. The mask can only be used by a member of a special Kurumba clan called "Sawadougou." Based on Kurumba mythology, Sawadougou came down from the heavens (similar to the Bamana myth) wearing a mask. His wife and children were "endowed with the features of the antelope, the hyena and the hare. They defeated the evil spirits during the first tilling of the land (Paudrat in Heut p. 102)."